In this provocative television essay, writer and broadcaster Jonathan Meades turns his forensic gaze on that modern phenomenon that drives us all up the wall - jargon. 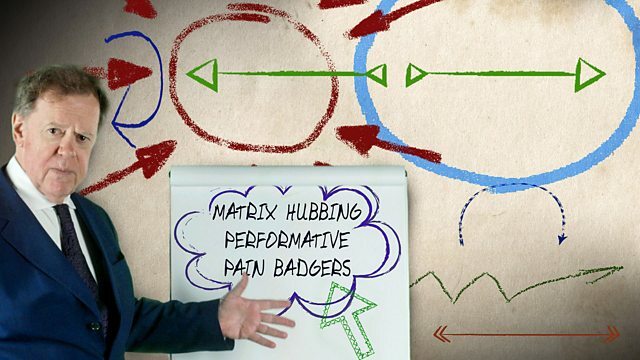 In this provocative television essay, writer and broadcaster Jonathan Meades turns his forensic gaze on that modern phenomenon that drives us all up the wall - jargon. In a wide-ranging programme he dissects politics, the law, football commentary, business, the arts, tabloid-speak and management consultancy to show how jargon is used to cover up, confuse and generally keep us in the dark. He contrasts this with the world of slang, which unlike jargon actually gets to the heart of whatever it's talking about even if it does offend along the way. With plenty of what is called 'strong language', Meades pulls no punches in slaying the dragon of jargon.